JNN 01 Dec 2014 WASHINGTON — Researchers from the Project Coranica at the University Library in Tübingen, Germany have discovered a copy of the Quran that may be the oldest in the world, dating to within 20-40 years of the death of Islam’s Prophet Muhammad. The copy of the Quran, dubbed Ma VI 165 by scientists, appears in the famous “Kufic script”, popularized by Imam Ali ibn Abu Talib a,s who moved the center of the Islamic government to Kufa in the after being elected as “Caliph” in 656 AD. The manuscript “with a 95.4% statistical probability can be dated to the period between 649 -675 A.D,” according to Medieval Histories Magazine. That the manuscript is on a high quality parchment that has survived for more than 1,339 years – with minimal preservation methods employed, further indicates that the document was created for official purposes, perhaps in relation to the work of Imam Ali’s Islamic government. Imam Ali is viewed by Shiite Muslims as the true successor to Prophet Muhammad, and the first in a line of holy leaders tasked with bringing justice to the world. For Sunni Muslims, Imam Ali is revered as the fourth and final “righteous” Caliph. The entire manuscript can be viewed here. Up until today, the famous Sana’a manuscript has been viewed as the oldest manuscript, dating back to almost exactly 671 AD. The MA VI 165 script cannot be narrowed down further than between 649 AD to 675 AD, so now both documents are tied for the “oldest copy” record. 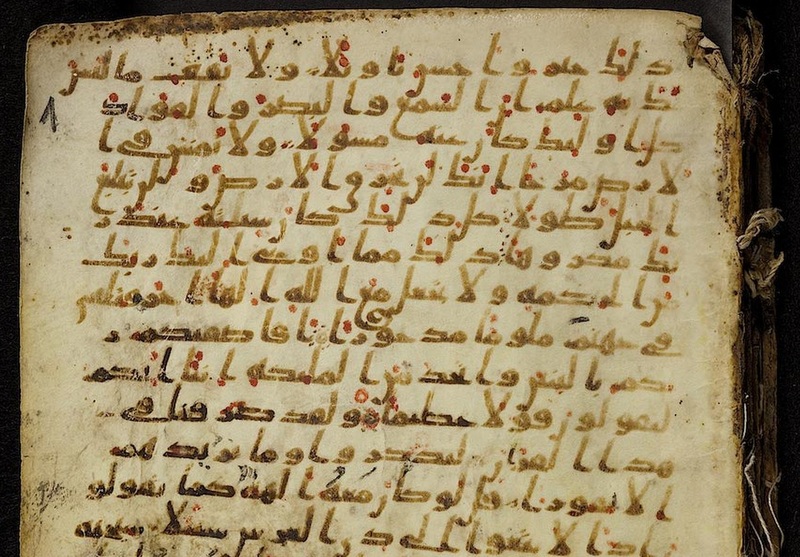 The MA VI 165 script is viewed as a “very early Quran” because it is written in something called the “Hijazi” variant, a type of Arabic writing that is sloped and has a distinctive style. Quranic manuscripts that utilize the Hijazi variant typically draw immediate attention from researchers, as the script is only used in very early Quran manuscripts. Hazrat Imam Ali a.s has gained great attention this year, having been quoted by notable celebrities and politicians. In the most recent instance, NFL player Pierre Garcon posted a famous saying of Imam Ali on social media. This entry was posted in America, Europe, United States and tagged Imam Ali, Imam Ali a.s, Kufi Manuscript, Qurani Manuscript, University Library, World Oldest Quran. Bookmark the permalink.